I love the Mac. I love what it did for me, it gave me a lot of freedom I wouldn’t have gotten any other way. However, it stopped short of where it could have gone, and in doing so, I hope serves as a lesson for future generations of technologists. 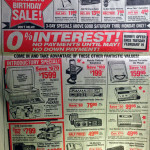 Everything From This 1991 Radio Shack Ad You Can Now Do With Your Phone. I sort of hate my phone now.